Used the high forest entrance (054239 A) which has parking at side of road. The forest road certainly makes an impression running straight as a die with walls at either side, wondering if there is something more than the pine trees ahead. The communication masts are visible here, peeking out above the trees. The forest shade was a welcome break from hot sunshine as i passed trees of honeysuckle. The road meanders up the hillside coming out into a large area of clearfell, where ripe blackberries had to be eaten as i looked over to Slieve Gullion. 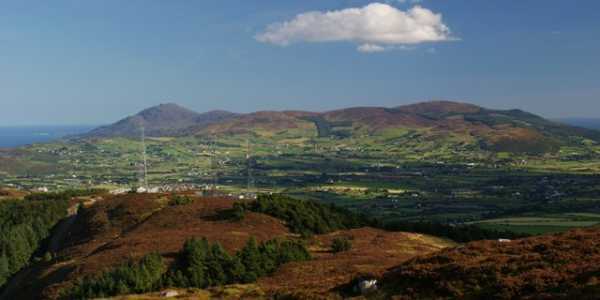 With height the Cooley Mtns, Carlingford Lough and Slieve Martin come into view. Leaving the trees it is a short walk to the communication masts - one has an impressive five padlocks all in a row! The summit itself is now visible across a sea of mature heather, a discernable track heads off from behind the first comms station. A few maker posts show the way but it is heavy going and the track can be easily lost in the deep heather. A final steep pull brings the summit itself. The summit has the remains of a large wooden cross. Views are impressive over Cam Lough to Slieve Gullion, the Cooleys ending impressivley with S Foye, the Mournes from Slieve Martin all the way to Slieve Donard, away N & W to Lough Neagh and the Sperrins, the Belfast and Antrim HIlls. More immediate civilisation brought the busy A1 and Newry but in reality it was a world away.